There are a lot of new products sneaking their way into Lush stores around the Country. Some have been filling Instagram feeds for months, adored by Lush fans for their fun, quirky and imaginative designs. There's products that really stand out from the long-standing Lush products we've all come to love over the years, and there's no denying they are taking the Lush world by storm. Yoga Bomb made it's way into my basket when recently visiting Lush in Nottingham and I have to admit, I think it might be a new favourite. Although I love making online orders, I find buying Lush products in-store more fun and easier, too, because I can see first-hand how big they are and most importantly, how they smell. It was the scent of Yoga Bomb which made me decide to add this one to my ever-growing Lush stash; soothing and uplifting Sandalwood Oil teamed with toning and relaxing Olibanum and Ho Wood, which together add lovely floral notes, alongside Cassie Absolute, a lovely fruity finishing touch. It's refreshing and comforting, absolutely perfect for an evening wind-down. It's not just the scent that makes this a new favourite bath bomb for me though. Looks can be deceiving and Yoga Bomb is the perfect example of that. 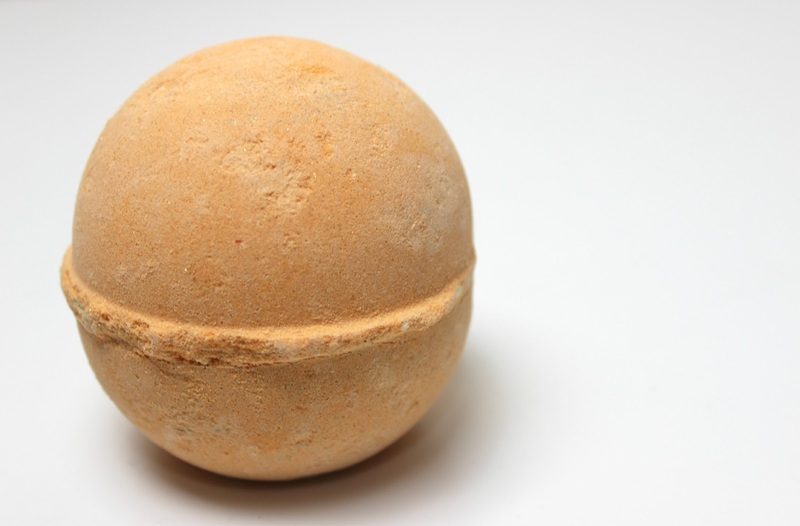 A bath bomb that looks so simple and even 'boring' at first glance, yet has the most exciting and beautiful centre which creates a stunning bath time. The outside fizzes away to reveal soft pastel orange and tones of yellow, whilst the inside is hiding beautiful purple and turquoise which slowly unfurl into your bath water making a beautiful contrast against the pastel orange. Add to that gold lustre and you have one magical bath bomb that's sure to make any bath time special. Yoga Bomb may not look as exciting as The Experimenter, but it's easily just as beautiful. Available in-store and online at www.lush.co.uk, £3.95 each. Sounds lovely and I don't think any lush bath bomb looks boring as they always seem amazing. Sounds lovely! I haven't used a bath bomb in years! I love this one! It smells sooo good. Its super glittery as well. It's my favourite of the new 'year round' bath bombs. I love this one too! I agree it looks boring but it most certainly isnt! That sounds beautiful, I've just had a Lush delivery today. Very exciting!